IM Creator (XPRS) – is a free website builder, which comes with a convenient WYSIWYG editor and provides an extensive variety of advanced features needed to launch and manage different types of projects. The system is mainly geared towards the needs of artists, who need professional portfolios, entrepreneurs willing to establish reliable business presence and web designers involved into the development of websites for commercial and non-commercial use. It also works well for the creation of eCommerce websites, landing pages and blogs. Launched in 2011 in New York by Jonathan Saragossi, the website builder now is one of the best SaaS-platforms with a visual editor. One of the interesting features of the system is its free premium accounts for non-commercial organizations, students and artists. Other people can also use IM Creator for free, but they don’t have an opportunity to connect their own domains to the websites created. Also surprising is that eCommerce functionality is included with Free accounts. This is quite unusual. Any person can start selling products or services in terms of the platform without investing any money at all. IM Creator initially seems like a very interesting website builder. It is mature, appealing and offers solutions that are non standard for the niche. It looks like we have the leader of the WYSIWYG niche in 2019. As of today, more than 17 millions of websites have been launched with it and many more are under development. The final decision regarding the use of the platform still depends upon the quality of realization, depth of functionality and convenience of use you expect to avail in the long run. Now, we can analyze all the features of the service to draw the concrete conclusions. Decent tool for small businesses and creatives. 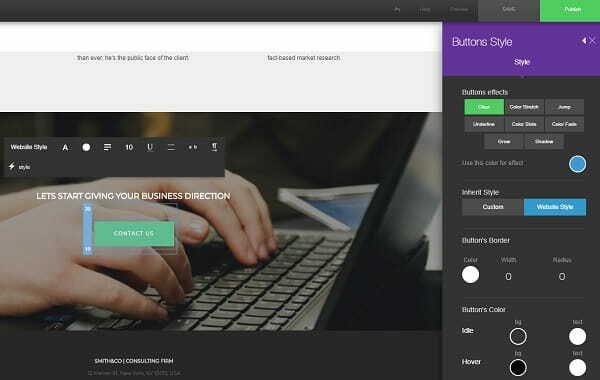 IM Creator is a website builder with one of the most convenient visual editors. One of the undeniable highlights of the system is its “Stripes & Polydoms” technology that looks quite advanced and even a bit futuristic for users, who have never encountered such a website design approach before. All the projects launched with IM Creator are made of responsive blocks – stripes of versatile structure and functionality. By interchanging the required stripes and setting them up, you get a readymade website. There is nothing simpler than that as the process somewhat reminds standard drag & drop web design approach. There are non even any widgets (separate elements) here, which are often considered too complicated for combination by many users. Due to the availability of the ready made blocks, the system ensures complete automatization. It’s impossible to mess anything up here. When you register with the system, you just need to provide your email, password and nickname to get started. Right after that, you’ll be redirected to the dashboard, where you’ll have to pick a template and start customizing it. The interface of the service is pleasant, the ergonomics are top notch level. Nonetheless, the editor abounds in options, icons and other elements. It is moderately simple and you have to be attentive when working with it. Otherwise, you risk overlooking menu access, a switch option or something like that. The majority of the settings panels come with tabs. IM Creator is a bit deeper and more complicated than you might think at first glance. Generally, this is one of the most convenient and logically-structured systems. It is a perfect choice for newbies. It takes around 1-2 hours only to explore it. What matters most, IM Creator allows getting the required result quickly and effectively. If you wish, you can publish your website the same day you started building. Due to its approach to web page design, the system ensures reliable protection from any mistakes. Whatever you do, this will initially look nice. IM Creator excels at functionality, flexibility and feature set provided. As mentioned above, the major functional element of this website builder is a stripe. Each page consists of interchangeable responsive blocks with versatile content. Depending on its purpose, each stripe has its own settings. The essence of building websites with IM Creator goes down to the right compatibility and design of such blocks. Their combinations and design edits allow for maximum flexibility. Websites created with the system will look similar and have the same conception because of a simple working process. That’s not bad as they have modern look, are quite functional and can boast appealing designs on any devices. Unification of the web creation process simplifies and speeds up the work, especially for newbies. Generally, IM Creator is a decent choice in terms of the organization of the working space and seamless approach. Almost all the actions within the editor can be made with a mouse only. The borders of each block are clearly seen and you can move them to narrow down and extend the working area of a container. It is also possible to change the block places, copy and delete them. Apart from that, you can manually regulate the maximum block width, spaces, positions of inner elements as well as set up the display format. The system abounds in options and features. To add new stripes, you should activate the “+” button between the neighboring blocks. You’ll see a beautiful animation and the list of the available stripes, which are sorted out by categories based on their purpose: header, projects, services, features, gallery, pricing, team, article, text block, bio/cv, blog, forms, slideshow, social, call to action, testimonials, logos, maps, widgets, elements. Each category contains around 5-10 block realization options. It should be mentioned that stripes «widgets» category allows adding the Google event schedule list, SoundCloud audio player, OpenTable reservation form (which makes IM Creator an interesting solution for restaurants), PDF viewer and connecting Facebook comments. In other words, you can add blocks here, the functionality of which will differ from the combination of the standard elements (text, images, video etc.). The basic principle is as follows: editor areas are subdivided into sections, by clicking which you get a menu of tools, options etc. The items you will be offered will depend upon the block and element type you will click. There are several variants here. Have a look at the example: some blocks come with a small “+” icon, by clicking which you will be offered an «Add a new element or item» menu to add videos, icons, links, dividers or blank containers. “Pro” makes it possible to choose the maximum stripe and content area width as well as the space values (padding/margin, px) for each element inside a section. It should be mentioned that Section Settings for different stripes may notably differ in terms of the character and structure of settings. 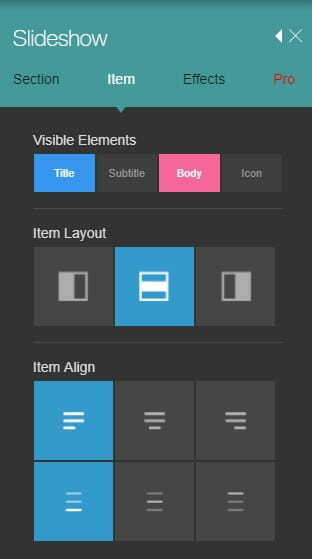 That is why, you have to be very attentive, when working with IM Creator editor: there are not many options here at first sight, but new menus will start emerging as soon as you start clicking the elements and different screen areas. This is when the relatively simple editor transforms before your eyes into a powerful tool with many more advanced options. “Page widgets” that allows adding web page widgets (chat, share, feedback, loader, topper, ribbon, snow or custom code). That’s not it. There is also a tool bar in the upper part of a screen, which grants access to backup creation, reference section, website copy save option, cancel feature, preview, publication. You will also find a web page management menu here (creation, copying, filling out SEO parameters) and an opportunity to add/set up popup elements (fields, text, position, width and height, display terms). IM Creator offers extensive social integration options, which lets you select and connect social media profiles to the website you work on. There is even an opportunity to customize social media buttons so that they could match the overall design and style of your project. The website builder also comes with multilingual support tool, which allows for creating several versions of your website in the languages of your choice. There is no need to integrate special plugins or widgets to reach this goal – just decide on the languages you’d like to select for your project and go ahead to create them! By the way, if you have any doubts or are just not sure how to get started, IM Creator offers an informative tutorial that will help you launch and customize a multilingual website. Websites launched with IM Creator have a clear quality code and are well-indexed by the search engines. Having created a website with this service, you can count on good promotion perspectives in terms of those factors, which depend on the system itself (speed of work, web page code validity, correct out-of-the-box settings etc.). You can personally set up search engine visibility for each web page, add title, description and keywords, upload favicon and social image, connect Google Analytics and Facebook Pixel. Obviously, you can connect a domain name to the website, but only after you upgrade to the premium subscription. Apart from the sections, which differ in the type of the displayed content only, Blog and Store are especially interesting. These are stripes, the use of which can change your website type. Basically, these are independent functional units, which are wider than the other ones. It makes sense to discuss their features in detail. You can choose one of 5 variants of the news feed structure. All of them look visually appealing: title, description, full publication button. They can be designed by various combinations of positions and visibility. Apart from that, it is possible to insert a video or something else into the content field (the part, where an image is inserted by default). “Pro” that makes it possible to set up section width, content part, spaces between the elements and neighboring sections as well as to activate the image download ban option. You can view the posts list in this menu, change their sorting and add new ones. To edit the posts, you should choose a text and the «Edit Post» section in the opened menu. You will see an editor, in which you can prepare an article, using all the available IM Creator elements. Blog functionality is organized in a peculiar way here. It is convenient to use it, but its options obviously lag behind those of specialized services. Its feature set will be enough for a business website, a personal website or news presentation. “Pro”, where you can set up the maximum width of web store sections, separate items, content part and spaces between the elements. “Sections”, where you can get access to all the published sections with products and their settings: the choice of product type (physical, digital or service), cost edit option, SKU, names, subtitles, descriptions and upload of new products to the chosen section. You can also change product display order, add the discount in percentage, shipping cost or assign a «sold out» status. “Settings”, where you may find fields to provide your web store name, currency, shipping cost and email for notifications. It makes sense to point out an important nuance: any item has a default «buy» button, which comes with a link to the shopping popup. That is, a popup window will appear after you click on it, which will offer you to provide your credit card data and email to confirm the payment as well as an opportunity to send notifications about an order status. Helpful Tip: if you wish to open a separate page with product description, you should tick a «description» box in the «Products» section. You can also add or replace an image there. These data will be displayed on a separate product page. IM Creator online store is quite simple. Show windows look appealing, it is easy to edit them and add products. They offer basic currency, payment and shipping settings. This solution will come up for trading platforms with a limited product list. For example, you can create several pages and add product categories with 2-3 show window screens on each of them. Such an e-store will function and look well. As for the White Label tool – it works great for web designers, resellers, hosting companies and white labels – that is, for all those users, who plan to apply the entire feature set of the website builder to start their own businesses. The White Label license model grants users the unlimited use of all the website builder resources. You can use the service under your own brand name without mentioning the third-party representatives and launch your own SaaS projects to make a profit. This can be beneficial for independent web designers, who need unlimited access to the website builder, web studios, hosting companies willing to launch their own website builders or corporate clients, who have the intention to establish their business presence on the web. IM Creator has a 14-day money back guarantee for those users, who decide that White Label isn’t for them for any reason. The system also guarantees secure payments due to the incorporated SSL Certificate. Templates are, probably, among the strongest IM Creator points, when it comes to customer generation. The website builder currently offers modern, visually-appealing and professional themes to fit various niches. The platform cooperates with some of the best web designers, who are responsible for template development and, thus, it puts a powerful emphasis on contemporary website and graphic design trends. IM Creator templates consist of stripe-related tools you get along with an editor. Obviously, design will matter a lot here. Ready made designs look very nice. You cannot call them stunning as we still deal with a typical responsive structure, which features standard tendencies and consistency. Nonetheless, the choice of templates is appealing due to their quality and versatility of section design approaches. It should be pointed out that you cannot change a template when working with it. If you edit the content and save it, then you’ll have to create a new website to change a template. So, it makes sense to choose the design that will be maximally close to your goal right from the start. Template categories are as follows: business, services, art/design, health/wellness, photography, restaurants/food, ecommerce/retail, fashion/beauty, weddings, music/video, lodging, tech, reseller. Category names give a hint on the niches IM Creator works best for. It makes sense to highlight restaurant, wedding and business. By the way, eCommerce designs also look pretty good. You aren’t likely to find a customer, who will refuse to place an order in such a web store, assuming a product matches their requirements and preferences. We also liked music templates: they are attractive and make it possible not only to present your creativity, but also to sell music or video. 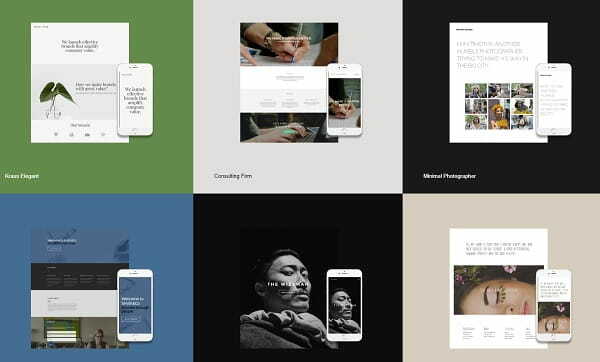 All IM Creator templates are scalable and responsive, while design customization options are versatile and powerful. 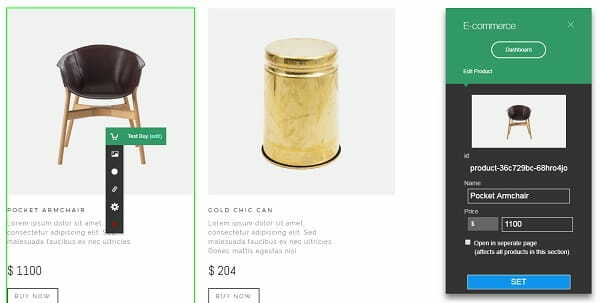 The website builder offers interesting design tools like scrolling, entrance and mouse-over effects, for example, which give your a project truly modern and fancy look. It’s possible to add or delete the sections, change their positions, set up the structure of each of them, spaces, inner content etc., when designing your website layout. The system abounds in free fonts and icons you can choose with regard to your project style. Image editing options are also extensive. You can crop and edit the images as you wish, choosing their opacity and color, applying animation effects etc. There is also an opportunity to add your own widgets as a code. To do that, you should choose «Raw» in the «Website Style» options block and then access the «Code» tab in the menu you are offered. This is where you can write any HTML, JS and CSS code. You can also select «Raw» widget in the «Elements» section and do the same. Generally, IM Creator websites look modern and attractive. The animated preview mode will surely appeal to many users. Nonetheless, you cannot change templates on the go and edit the codes of the available stripes or items. However, you can add HTML code to a header or integrate your own widgets into a website. This surely requires coding skills and not everyone needs that. The majority of users will be satisfied with visual design editing tools and results. Widget integration via code insertion. There is a “Help” link in the IM Creator editor header, where you can activate tips, view a short informative video on how to work with the system, visit the Knowledge Center (a detailed FAQ with sections and search option) or get in touch with the tech support team, leaving your Email for feedback. When it comes to customer support, the service features a standard for the first-class projects level: live chat support, 24\7 email support; everything you need is available here and works on a decent level. Abundance of tips, video and text tutorials. Students, artists and non-commercial websites can get premium IM Creator for free. With this purpose, they have to get in touch with the tech support team of the service by special form, having provided the reason and proofs of compliance with the terms of the free license use. Others may use the system for free for the unlimited period of time, having availed all the features of the editor. In this case, however, it will be impossible to connect your own domain. These restrictions are removed after the purchase of any premium license. SSL Protected ($21/month) – features of the above mentioned plans plus an opportunity to connect the SSL certificate to one domain name. When it comes to functionality, IM Creator doesn’t have any pricing plan distinctions. The question is about the period you’d like to pay for and the need for SSL. As a rule, a longer term rent is eventually more beneficial. It is also important to specify the eCommerce billing nuances. All the sales profits are accumulated on the inner account of your plan. The money can be further transferred through Stripe with a 5% IM Creator commission fee for the payment transaction. Standard White Label ($350/year) – Unlimited Licenses, Remove IM Creator brand & replace with yours, Full billing & pricing control, Full control over users, Show your own templates. Host It Yourself ($2500/year) – offers the features provided by the Standard White Label plus cPanel Integration, Get downloadable version, Host websites on your servers, Editor’s CSS control, Your own domains API. Servers Control (25K/year) – provides the above-mentioned features as well as Login APIs, cPanel & API, Server ownership. The purchase of a standard license version makes it possible for an ordinary user to create the unlimited number of websites within the system. You will be offered a feature set at the 3.5-year rent cost on the terms of a standard premium license. This will surely be beneficial for web designers. Generally, the cost of using IM Creator is more than affordable. For around $100/year, you can run an appealing business website or even a web store. This is one of the most beneficial niche solutions that features decent price/quality correlation. Free plan for students, artists and non-profits. IM Creator is a quality WYSIWYG website builder that features brand style and approach to the web building process. When testing the service, we have defined both strong and weak points of the system and it’s high time to mention them now. ✔ Appealing responsive templates, an opportunity to add your code to the website. ✔ Abundance of stripes, convenient customization of sections. ✔ Practical and affordable White Label model. ✔ An opportunity to get a free premium license for non-commercial projects. ✔ Powerful eCommerce engine. ✘ You can’t upload your own fonts. ✘ You can only sell one item at a time for eCommerce. As to the rest of parameters, IM Creator creates the impression of more than a decent system. This is especially true, considering the low cost of the service and an opportunity to open a web store for $100/year. Free license for non-commercial projects. IM Creator is an advanced WYSIWYG website builder, which is a great value for your money. The service will initially meet the needs of small and medium businesses and it will also work great for artists, students and non-profits, who will get an opportunity to run a website at no cost here. The platform comes with a powerful eCommerce engine, blogging options, an abundance of responsive templates and extensive design customization tools. The system will appeal to practical people, who value the result above all. Yes, the model of creating web pages out of stripes implies certain website similarity. owever, it is easy to launch them, the design is appealing and the websites are perfectly displayed on any mobile device. In our opinion, IM Creator is a very good product that may be of great interest for many users. It also makes sense to consider the White Label Standard solution, which offers beneficial terms for the developers of client websites. The disadvantages of the service are minor, while the advantages are substantial. We definitely recommend it.